It's that time again! 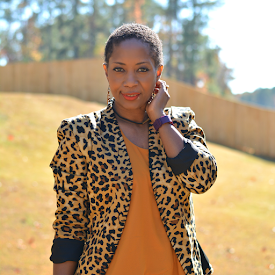 This month's Thriftanista is my long time friend (seriously high school) Venita of the blog, Girl...get a life! She's a thrifter, an eBay queen, a writer, a news junkie, football fan, gorgeous shoe collector, and she cooks! Whew. She should probably add interior designer to her list because she has a beautiful home filled with art and vintage finds too. She normally doesn't do style post on her blog so this is a special treat. Let's get started! Crossroads Trading. Unique. Salvation Army. 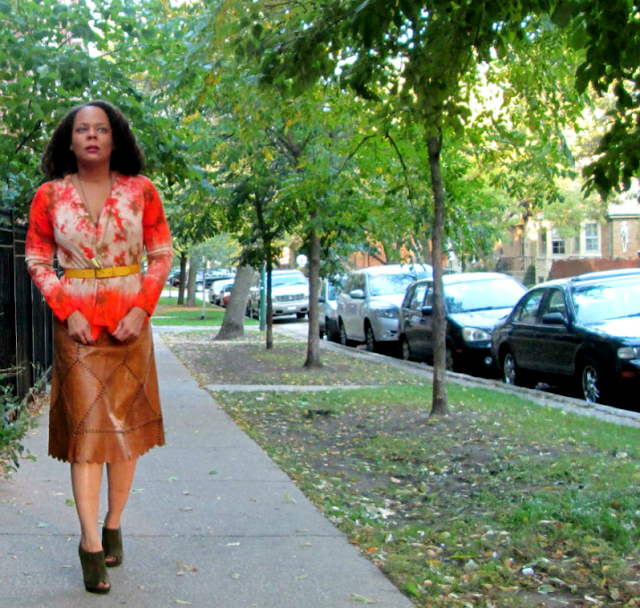 A brown leather ‘Catch a Fire’ Skirt. A black leather Cynthia Steffe cropped jacket. A green leather afro lady bag by Wabags, Coach calf hair animal print oxfords, a green leather jacket with a ruffled front, and a floral leather Tuleh skirt – I gasped when I saw it. I had trouble describing my style, so I asked a few friends. The responses included “modern with vintage accessories”, “Sexay!” (from a guy, obviously), and “special” (from an ex). I don’t think any of those descriptions fit and I still can’t describe it! The dress aisle. I am always on the hunt for a patterned silk jersey or a light-weight wool dress. I own over 50 dresses, not because I’m uber feminine, but because I’m lazy and they’re super easy. I like to shop. Shopping retail all the time can break a girl. Plus, it’s environmentally friendly…every little bit helps! It really depends on the store. If I’m at a higher end thrift-store, I’ll set a $50 budget. If I’m at Goodwill or Salvation Army, I’ll try to spend between $15 and $20. But, really, I am not that disciplined and, depending on what I find, I’ll throw the budget out the window. Vintage sterling silver or brass modernist jewelry. I can never find any at the thrift stores and pieces go for so much on ebay. Have time to kill. I find the best stuff when I have time to dig. I quickie thrift store run doesn’t work for me. Rethink a piece. I found an awesome velvet leopard coat that is currently being reworked into a fitted trench. Because you spend so little on thrifted items, you can afford to have them tailored/reworked. I’ve share some of my jewelry finds on my blog, www.girlgetalife. I hope to include more style posts…but taking these pics is hard! If you'd like to be featured in this monthly series, email me at info@thriftanistainthecity.com. I love that leather skirt! The Catch Fire skirt and the BCBG skirt. She has serious style and I will agree with her male friend that said it's a bit "sexay." I learned a new term today - "white whale". And I have to find a better Unique, the one near me is blah. I love giving things to Goodwill or similar. Not that my castoffs are so great, but I always imagine some woman getting excited over something that's just been sitting in my closet. Recently I donated some Limited jeans that had been given to me that some HS girl is going to love. Great finds "Girl...get a life!" Too fun to get to know more about you. Such great style! That Catch Fire Skirt is perfect. Wow, I love these styles. The Catch Fire skirt took my breath away too! Such gorgeous detail and the leather looks so supple. Great find, Venita!! Really? I'll have to investigate. I'm the one always exclaiming why did they get rid of this! That could be problematic. We had a great time last week. Good thing we're different sizes!